Clean seasonings and snacks to make your taste buds happy. Born on the beaches of Cape Henlopen, Lewes, DE. Soul Blend Seasoning. Ten (10) herbs and spices. These savory and aromatic leaves and roots actually grow. No chemicals or sugars, MSG, or whatever. Low sodium. Perfectly 55 mgs. of sea salt per serving. Most major brands start at 160 mg., using idodized salt. An all-purpose blend for people who "like to play with their food." Meats, poultry, vegetables, seafood. It enhances the taste of food, not overpowering it. 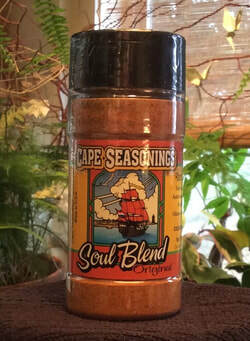 Rich in Capsaicin (Cayenne Pepper, Onion, Garlic), Soul Blend is a healthy way to cook or add to your food at the table. Simply delicious. Crisp, kettle-cooked potato chips. Naturally seasoned with Soul Blend Seasoning - ten (10) herbs and spices and extra virgin olive oil, because it tastes good. No chemicals or sugars. Lightly-salted at 110 mg per serving. Baked by hand in our kitchens on baking sheets, not sprayed by machines in a factory. All of the herbs and spices are beneficial for you. And we bake them onto potato chips! Be careful: these babies are addictive. It's a beautiful thang. So please eat responsibly. ﻿Sourdough Pretzel Pieces. Baked in Soul Blend Seasoning and extra virgin olive oil. Bite size broken pieces of sourdough pretzels. Delicious with sharp cheddar cheese, green apples, and red wines. Of course, rich in flavor all by themselves. And then again, a "cold one" while watching sports is a fine way to pass the time. Sourdough Mini Pretzels. Baked with Soul Blend Seasoning, extra virgin olive oil, with special guest stars Turmeric and Cinnamon. Both spices are anti-inflammatory. Think about it - eating pretzels while helping you be healthier. What will they think of next! Simply Crunchy Kettle Cooked Potato Chips. 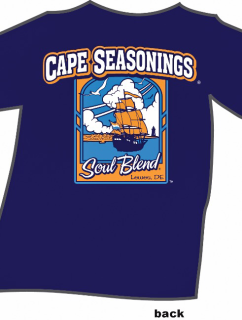 Cape Seasonings now makes delicious, crunchy snacks without seasoning. Some people are sensitive to the effects of Capsaicin, so here are our non-seasoned chips. No chemicals or sugars. Vegan. And for our Indian friends, no meat products. Simply Crunchy (TM) Sourdough Pretzel Pieces. Bite-sized pretzel pieces without the seasoning. A naturally flavored hard pretzel. No additives, preservatives, sugars, or chemicals. Simple Crunchy (TM) Sourdough Pretzel Minis. Great for sandwiches and packing school lunches. Natural pretzel flavor. Clean snacks like all of Cape Seasoning products. Here we go. We call this our Cape Party Mix for obvious reasons. Try snacking on this with a favorite adult beverage and see what happens to your taste buds. 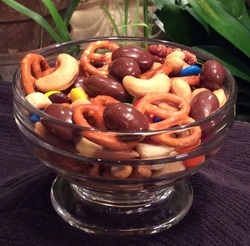 A mix of various nuts, Sourdough Pretzel Minis, candy coated chocolate drops, and chocolate covered almonds. Or as some of our fan base does, keep it in the car for trips to munch on. Very nice. Soul Blend Panko. Crunchy. Stays crunchy when baking or when sauteeing. 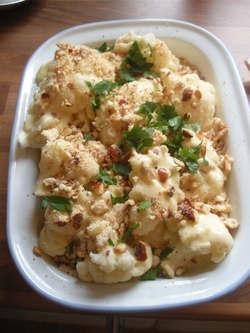 Shown here from a dish by Brian from County Cork in Ireland on baked cauliflower with cheese and parsley. 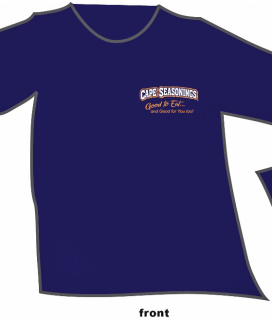 Breaded seafood (Salmon; Cod; Flounder; Calamari); casseroles; or the most wonderful comfort food there is - meatloaf. Panko.